WATKINS GLEN, New York – June 27, 2015 – Rain played a big role in Saturday’s Continental Tire SportsCar Challenge race at Watkins Glen International, but in the end Doran Racing’s #14 Nissan 370Z driven by Brad Jaeger and B.J. Zacharias posted its second consecutive podium finish both in the series and in this race. The weather made for slippery conditions and poor visibility throughout the event, but all concerned did their best to deal with it, and both of the team’s cars returned to the garage area unscathed. The 2.5-hour race ended under yellow with 45 laps complete after a red flag to try to sweep standing water off the course, and Zacharias took the checkered in third place behind Andrew Davis and Robin Liddell’s Camaro and Ashley Freiberg and Trent Hindman’s BMW. Jaeger qualified second on Friday, which was the Lebanon, Ohio-based team’s best starting spot so far this year. There was a full-course yellow almost immediately when two Street Turner cars crashed, and shortly after the restart Hugh Plumb got by Jaeger on the outside in Turn 11 to push the #14 back to third. Jaeger regained second on lap 13 with 37 minutes gone when the second-place driver, pole winner Scott Maxwell, had to serve a drive-through penalty for jumping a restart. Jaeger set his car’s fastest lap of the race on the following lap with a 2:25.810, but he was about 2.566 seconds behind the leader, Hugh Plumb, at the time. Jaeger dropped from second to fourth on lap 17 when both Andrew Davis and Austin Cindric got by as the wind began to pick up. Jaeger’s windshield had been fogging up from the start, and there was almost no visibility on the right side. He remained in fourth place until he pitted under green on lap 21 with 57 minutes gone, and Zacharias started his stint in ninth place. That was the entry’s only pit stop, and team owner Kevin Doran’s strategy proved to be spot-on. Zacharias got eighth when the seventh-place driver, Rob Ecklin Jr., spun in the inclement conditions. He moved up another spot due to a rival ahead of him pitting shortly afterwards, and then he moved from seventh to fourth on lap 31 with 1:06 remaining after several more front-runners pitted. He was about 11 seconds behind the third-place driver, Hindman, after those pit stops, but he was able to make up that gap easily when David Russell stopped at the entrance to Turn 10 to bring out the third full-course caution on lap 34. He got third easily too, as the second-place driver, Matt Plumb, fell to sixth after a big slide trying to avoid a spinning Corey Lewis at the exit of Turn 1 after the restart on lap 39. A wrecker was required to remove Lewis’s Porsche Cayman, which brought out the fourth full-course caution on lap 40. The race was effectively over at that point. After circling the track under yellow for two laps, the officials threw a red flag to allow track sweepers to try to remove some of the standing water around the course. That took 16 minutes. The race restarted under yellow for three more laps before time ran out and a very wet checkered flag dropped. 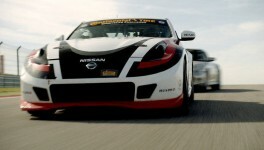 The #14’s sister Nissan 370Z, which also advertises Nismo and Nissan’s popular GT Academy, didn’t fare as well. Nick McMillen started fourth, right behind Jaeger, but he spent most of his stint in seventh, eighth or ninth place. McMillen set that car’s fastest lap of the race on lap 12 with a 2:27.735. McMillen pitted right after Jaeger did. He was seventh when he pitted, but co-driver Steven Doherty started his stint in 18th overall and 13th in class and he was never able to move up due to visibility problems. That car ended up 14th in class at the end. The race will be shown at 10 a.m. Eastern on Sunday, July 5 on Fox Sports 1. 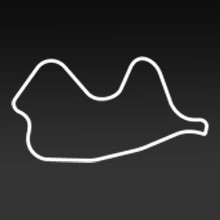 The next race is July 11-12 at Canadian Tire Motorsports Park. Brad Jaeger, Charlottesville, Va.: “That was my first full rain race that I’ve ever been in in this series and in a Nissan 370Z. It was an experience, and everyone at Doran Racing did a great job to hold onto that third-place finish. “We had challengers coming from behind the entire time. Kevin did an amazing job with the one-stop strategy. We came in, and held on to that third place. “We had an amazing car in the dry. We all wanted to see what we could have accomplished in the dry, but we can’t control the weather. We had to react with what we were dealing with, and I think we reacted quite well. “The visibility was as bad as it looked [on the live video streaming.] Our windshield fogged up. I crouched as low as I could to try to see out the windshield. But ultimately we did a good job managing it. B.J. Zacharias, Cincinnati: “It was a good race. I would have liked to have had a shot at the end because I think we could have gotten second, but conditions were getting worse and worse. We got good points, the car is in one piece and it’s two podiums in a row, so that’s good. “I guess we’ve been fortunate that we haven’t done many Continental races in the rain lately. On the driver’s side the visibility wasn’t as bad as it was on the passenger’s side. We tried a sponge on a stick for a sort of squeegee, but it didn’t work too well. “I was just sort of driving around during my stint, but towards the end of the race Liddell and I had the fastest cars. I think we had the speed, but that’s how the cookie crumbles. Considering some of the things that happened to some of the other contenders, we’ll take third. Nick McMillen, Salem, Ore.: “It was one of the most challenging races I’ve ever had. “Everything was pretty good at the beginning. I’d never driven here in the wet before and I let a couple cars around me at the start, but then I started to feel comfortable. A couple of those restarts killed my momentum though, and a Camaro and two Mustangs went around me on one of the restarts. Steven Doherty, Plainfield, Ill.: “There was something on the inside of our windshield that made it so we couldn’t wipe the fog off. We had zero visibility. We could see the color of the barriers, but that’s about it. “It’s disappointing. We were so good in the dry. We pitted a couple times to try to solve the problem, but we never got it solved. We had a squeegee in the car, but as soon as you squeegeed it the fog came right back.